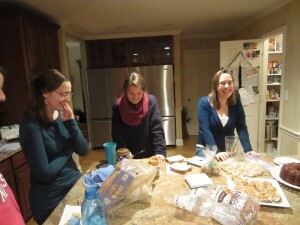 This past weekend I found out just how naturally frugal some of my church friends are! A few weeks ago one of the women in our small group suggested a day trip to a ski resort in West Virginia. The decision-making cascade our group made from that invitation was exactly in line with what Kyle and I would have wanted to keep costs down! Lodging: Even though we had to drive from NC well into WV, the plan was to leave at 4:30 AM, drive for 4.5 hours, ski until 4:30 PM, then drive back. We never even considered spending a night elsewhere, so we had no lodging costs. We spent the night before at my friend’s parents’ house and half our group spent the night after, too. Transport: We had seven people going on the trip across two cars, so we split gas evenly. Food: We all packed a breakfast and lunch and planned to get fast food during the drive back, so our food costs were as low as possible. In fact, we were so busy skiing that we skipped lunch, so we didn’t even have to stop for dinner. Lift Tickets: By the time we got our plan together it was too late to buy discounted advance lift tickets, so we planned to buy the full-priced lift tickets at the resort. But I checked the resort’s website and saw that Costco members got a discount, so we bought most of our lift tickets at about 25% off before we left Durham. Once we got to the resort, another member of our group bought a voucher from another skier and we got our final lift ticket at about 35% of the full price. This was the biggest cost of the trip so it was nice to get a discount. Major Equipment: Our only non-frugal choice was to rent boots and skis at the resort. We looked into renting equipment in Durham, but we didn’t think the price reduction was worth the room in the cars and risking not being able to exchange stuff that didn’t fit properly. Minor Equipment: Kyle and I are not exactly accustomed to being in cold weather, so we had no snow-specific clothing. We just layered up underneath our rain-appropriate jackets and borrowed ski pants and goggles from some friends not going on the trip. We did buy some eyewear and a pair of pants for Kyle but those should be multi-use items. In total, we spent $303.43 on this trip. It seems like a lot of money for seven runs down the slopes (we’re beginners! we went slow!) but I enjoyed trying something new and hanging out with friends for the day. Even ten hours in the car is pretty enjoyable when you’re with good people. I don’t like having to play the “is this worth it?” game so I was glad we minimized the costs as much as was reasonable. It was a nice relief for Kyle and I not to be the most frugal people in the group like we were on our Chicago trip with a similar group of people. Also, next time I’m definitely going to take my camera on the slopes with me because I didn’t fall much at all and I wish I had action pictures! When you pay for experiences, do you try to minimize the peripheral costs or just not worry about it? Are you more frugal than your friends or similar? 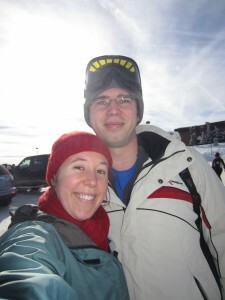 15 Responses to "Frugal Friends Go Skiing"
I’m definitely more frugal than my friends. Because just about the only experience I ever pay for is the movies. I’m just not into doing much traveling. For one, my knees don’t do so well folded up in a car or a plane for hours. I’m also terrified of heights, so you will never see me on a ski lift. That’s funny – we almost never go to the movies! Thankfully we are able to hold up in our long travels pretty well. I actually was more freaked out by the ski lifts than the slopes, surprisingly. No one ever put the safety bar down and I startled a bit every time the car shook or rocked! I don’t have much experience with skiing so I wasn’t sure what to expect from the price. In $/thrills terms I think I prefer amusement parks. The money we spent is definitely coming out of our targeted savings accounts – probably Entertainment for the tickets and equipment and Travel for the gas. It definitely was more of an impulsive trip than we usually take in that we didn’t estimate the expenses until just a couple days before. J and I are in the “nope, it’s not worth it” camp when it comes to skiing — even after the sandwiches are packed and we’ve dug out our hand-me-down goggles and gloves. I think skiing is only truly fun when I’m in shape for it and I’m hitting the slopes regularly. That’ll only ever be affordable, though, if I a) live close to slopes (<1hour) and b) buy a season pass and make it my sole hobby for the year. Cheaper, more low-maintenance thrills we've found are rock climbing and cross-country skiing. But if all our friends were going out for the day, we'd definitely splurge! Yeah, Kyle and I decided that we probably won’t ski by ourselves unless it’s a mutli-day trip when we can really learn how to do it well. It was fun to go with a group, though. Ok, now I categorize multi-day trips into “fun” for sure! I got a huge cabin once with like 12+ friends and we split the rental costs and meal preps. Skiing in and out of the cabin to the lift was awesome. I can’t remember how much it cost… we did what we could to be “frugal”…. but I still think, unfortunately, skiing is expensive any way you look at it. Frugal friends are the best! I feel like once you remove the forms of entertainment that cost money, your friendships grow stronger because you’re spending time focusing on each other and talking instead of buying clothes, watching a movie or whatever other costly hangouts you would normally have. I’m curious – now that you know these friends are frugal, do you think that will lead to spending more time with them? Hmmmmm, probably not as we already spend a lot of time with this group in low-key settings. But I will be more likely to suggest frugal alternatives if we take another trip together. Kyle and I kind of kept our strategies to ourselves on our trip go Chicago.